The coming December of 2012 will see PACE BEIJING holding its third annual event “BEIJING VOICE” with the exhibition of “BEIJING VOICE: Zhang Xiaogang” as its anchor program. An internationally renowned Chinese contemporary artist, Zhang Xiaogang would cooperate with PACE for a third time in the wake of his “Revision” exhibition in PACE in 2008 in New York and “The Records” exhibition in PACE BEIJING in 2009. As an artist believing in the power of drawing, Zhang Xiaogang sticks to painting’s narrative quality and tries almost single-mindedly to bring historical continuity of art to the contemporary art scene. Thereby it will be the focus of the third “BEIJING VOICE” to explore Zhang’s creative career, which is not only almost the longest but also one of the most constantly active among all the Chinese contemporary artists. Reconstructing and juxtaposing typical images of history and reality, collective and private memories, Zhang Xiaogang brings history and memory to the present. Despite the fact that this period of history and its experience was a regional one, the collectivistic, Utopian spirit at its base aimed to liberate man in the spirit of cosmopolitism. Also, from the pictorial level, we can establish a certain connection between Chuck Close, Gerhard Richter and Zhang Xiaogang, which enriches the depth of the world of imagery. Close’s paintings are a logical, material and physical analysis of portraits; Richter’s paintings are a philosophy of images; while Zhang’s paintings are about the historic issues of human kind. Among these images are the birthmark-like prints and bloodlines in “Big Family Series”, the colored shades on the face and tear stains under the eyes in “Amnesia and Memory Series”, the electric wires, lamp cords, ink and pens in “In-Out Series”, the lines representing blood ties in “Green Wall Series” and the parallel tracks in “Train Window Series”. All these images extend the cultural historical memory contained in the artist ’s self -exploration which is exuberant with a mildness and tenderness that are unmistakably Zhang’s. Moreover, they could also be understood as a continued personalized expression of a collective memory. It is exactly Zhang’s primitive expression and adh erence to the traditional culture that brings back our belief in and worship of the narrative quality of painting. What Zhang tries to do through painting is no less than reconstructing “humans” and reinvigorating faith in an era overflowing with concepts such as “Super Flat” and “Cool”. The melancholy and isolated figures immersed in contemplation in Zhang Xiaogang’s works have already been interpreted by the West as the archetypes of contemporary China. In his new works, the artist would again return to his old acquaintance the old painting and continue his stylized tone with stains of time and warmth of life. The works are marked with the artist’s idiosyncratic honesty and reserve as well as his poetic sensitivity and hesitation. Zhang Xiaogang would narrate in a way that is filled with emotional connotation yet still retain the touch of rationality. And people could see him trying to figure out a complex relationship between men and society through the construction of a cultural memory that is shared by the Chinese people of particular historical periods. 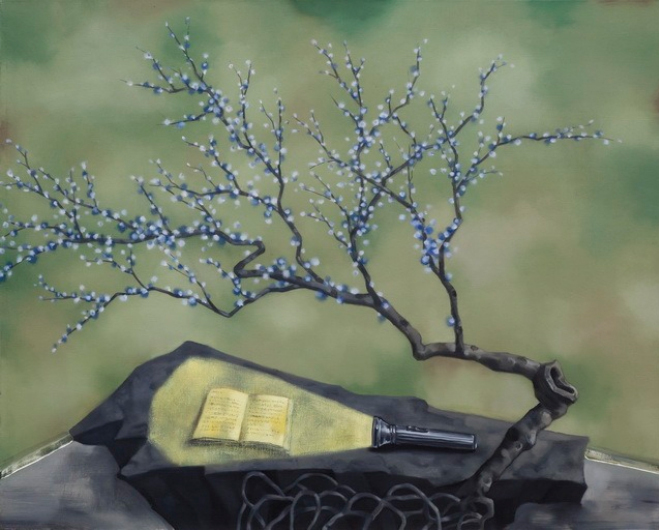 And once again in these new works– the glimmering flashlight representing hope and confidence in the future and the plum trees and potted pine trees standing for a platonic idealism — we could touch the tracks of history and feel the warmth deep inside of us through the classic language of Zhang Xiaogang. BEIJING VOICE was first held as an annual event by PACE BEIJING in 2010. The first event “BEIJING VOICE: Together or Isolated” used the form of exhibition to explore a number of phenomenon and problems existing in the contemporary art of China. And the second event “BEIJING VOICE: Leaving Realism Behind” discussed the effects and interpretations of the cross-fertilization of abstract art between t he East and the West. In the third event, “BEIJING VOICE” will place the solo show of Zhang Xiaogang at its centre. In the thirty-year history, Chinese contemporary art in general and Zhang Xiaogang in particular have both absorbed a gigantic amount of Western culture and art. Zhang’s works never sever his connection with history and memory or cease to do experiments with constantly changing forms of art. With his extensive contemplation on history and memory, we could see Zhang Xiaogang exploring not only the new possibilities of contemporary culture but also the process of the satisfaction of self -development as well as the formation of self-awareness. This solo exhibition of Zhang Xiaogang which will last from December 13th 2012 to February 28th 2013, wi ll serve as the first opening of his global solo shows. After this exhibition in PACE BEIJING, Zhang Xiaogang’s solo exhibition will be held another round in PACE at New York in April 2013 with different creating artworks, and solo exhibition in PACE LONDO N will be following next . Ever since 1989, Zhang Xiaogang has already held 18 solo shows and attended more than 150 group exhibitions. His solo show sites have covered not only Asia but also Europe and North America including exhibitions in China, Japan, Korea, Australia, America, France and Finland. Courtesy of the artist and Pace Beijing, for further information please visit www.pacegallery.com. For more press inquiries, please contact Sylvie Tiao, pr@pacebeijing.com/+86 .10.5978.9781 #811.